Parents may have some pretty good ideas about which foods are best for their children after pregnancy. Anything fatty, sugary, fried or salty is probably on the “do not eat” list. However, some foods may be so commonplace that you don’t even give them a second thought. Be sure to follow top mom & parenting blogs to keep yourself in the loop. 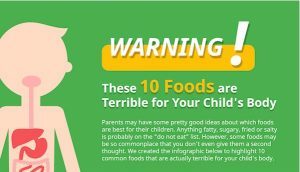 We created the infographic below to highlight 10 common foods that are actually terrible for your child’s body. Avoid these foods and only create amazing recipes using healthy home ingredients! The problem with mac’n’cheese out of the box is that it’s filled with sodium and preservatives. This is, unfortunately, an example of a highly-processed food that’s lacking in many nutrients. With a few limited exceptions, most of the cereals made with artificial colors and flavors (and usually featuring cartoon characters that are irresistible to young children) are terrible for your kids. Don’t be fooled by all the clever packaging. Popcorn (as long as it’s not slathered with butter and salt) has acquired a positive reputation in recent years amongst parents. However, microwave popcorn comes in bags that are lined with a potentially dangerous chemical known as PFOA that has been linked to cancer and high cholesterol. Unless they are made with real fruit, real nuts, natural honey and whole grains, each granola bar you give to your kids is simply filled with too much sugar for their little bodies. The processed bars most commonly found today offer little in the way of protein and fiber. In recent years, potato chips have tried to re-invent themselves as being healthy. They might claim to be “low fat” or “baked” and not “fried,” but don’t believe the hype. Researchers now view potato chips as one of the most obesity-promoting foods out there. Good old-fashioned yogurt, perhaps sweetened with fruit, raisins, is OK – but not the kids’ yogurt on the market today. If you see kids’ yogurt on the shelves in bright colors and cartoon characters on the packaging, steer clear. Even better: try a healthy smoothie instead for a delicious alternative. Unfortunately, hot dogs and bologna fall under the category of “processed meats,” which are known to be filled with fat, sodium and preservatives. If you’re looking for a healthy meal, it’s far better to carve your own chicken and use that for a sandwich. Chicken nuggets, chicken fingers, fish sticks and mozzarella sticks are examples of frozen finger foods that are flash fried. They typically are made from low-grade chicken or fish, and contain too much in the way of sodium and preservatives. If your little ones are running around in the hot sun all day, it might be tempting to give them a thirst quenching sports drink like Gatorade. However, unless they are on the brink of physical collapse, it’s far better to give them water and orange slices to replace valuable vitamins. Unfortunately, butter, margarine and all the other butter substitutes out there are too high in fat for little ones. It might be tempting to cook up some delicious foods with butter in a pan – like pancakes in the morning! – but it’s far better to use non-fatty oils and spreads.